Summer started a little bumpy, but I think I found a piece of sturdy ground to stand on and am beginning to lay the stepping stone for the path ahead, just one stone at a time. Or maybe in another point of view, I am finally feeling the path God has for me and I am learning to follow (again). I think everything begins with me, that I control the environment around me, I am the one determining the weather in my life. Even though summer is ending and fall is here soon, I feel like I need to start my own spring. A fresh, new, happier me maybe ? After school begins, my ultimate goal is to : Leave all work at school, home should be for friends, family, and me. This may mean going to work at 6:30 AM and leave work at 6:00 PM to avoid all traffic. Long hours, which means I need to pack lunches, but will probably be good for me if I can stick with it. 1. Made Dr.Oz’s Weight-Orade which is meant to boost metabolism and the best part is that the mint leaves and kumqua all comes from my own garden, while I love green tea in general, so it’s only natural for me to start off this way. If you want the the recipe, it’s here. I am going to try to drink at least 16 oz a day, which is not much, but it’s a start. 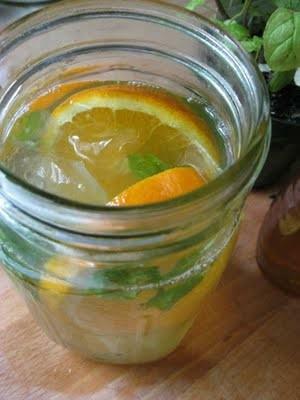 8 cups of brewed green tea, 1 tangerine, sliced and a handful of mint leaves. 1 pitcher daily. Goal for tomorrow: Get up at 8:00 AM, no more snoozing and no afternoon nap. I would say I am going to try to squeeze in a run, but I don’t think it’s going to be possible. I am also going to do work for my National Boards Certification so that I won’t be drowning in work when the school year begins. Yaye to new beginnings! And let’s pray I keep this up!